The images provided are for illustrative purposes only. Please refer to product description. FREE Gift The new KT64 Pro kit offered by Kewtech has everything an 18th edition installer would need. This instrument comes with a manufacturers calibration certificate. Please see 'Calibration Options' in the description for more details. Add Certificate Of Calibration? -- Please Select --Yes, add full traceable calibration certificate. +£25.00 (+£30.00 Incl. Tax)No, this is not required. This is a calibration certificate offered by the manufacturer supplied with the tester. This is also known as a end of line certificate or manufacturer’s certificate. These certificates vary depending on the manufacturer and product. They will not have your companies name on and don’t always show proven test results. This is a calibration certificate created by us at ISS. This certificate is fully traceable to national and international standards. The certificate will show your companies details, tester information, proven test results and the equipment used to carry out the test. Nearly 90% of all calibrations we do are done in-house in one of our many fully equipped laboratories. You can add this service to your order on the product page before you checkout. This instrument comes complete with your choice of free gift from the drop-down menu above. Choose from a quality set of 3-wire silicone test leads with croc clips, a calibration voucher for next year or a 50m R2 wander lead. How about any one of the IET Guidance Notes, or a Fluke T90 two-pole tester? Whatever you choose you can be sure you're getting a fantastic deal at Instrument Sales & Service. This new kit offered by Kewtech has everything a 17th edition installer would need. Not only do you get one of the fastest, most accurate and most reliable testers on the market, but now you also get a massive selection of testing accessories as well!. All at one fantastic price! For a full detailed list of what's included in the kit just look below. Have any questions regarding the tester or any of these units functionality then don't hesitate to get in touch. This instrument comes complete with the manufacturers dated calibration certificate. Please be aware that these certificates are generic and may also be time lapsed. If you would prefer a personalised full traceable calibration certificate applied to the equipment before dispatch, then please select this option from the drop-down menu above, an additional calibration charge will apply. Kewtech KT64DL Pro Tester - The easiest, fastest and most reliable tester on the market. Kewtech PAT Adaptor - PAT Test using your Multifunction Tester! One of our longest standing manufacturer partnerships and a brand that sells well day in day out for solid dependability and innovation at the price point. Kewtech manufacture innovative, accurate and reliable test equipment that enables UK electrical contractors to undertake their testing obligations quickly and efficiently. A product with the “Kewtech” brand has been specifically designed for the UK market by a team with many years of industry experience. We pride ourselves on developing and manufacturing products that have a real benefit to the industry. Kewtech has consistently introduced industry firsts, like our Lightmate testing adaptors, the Pat Adaptor, the MFT with PAT testing plus download and our award-winning RB1 Replacement Lamp. Our 17th Edition multifunction testers lead the way in ease of use, loop accuracy and repeatability of reading. For full product specifications please see the attached Data Sheet under the RESOURCE Tab. Included in the price for all orders over £40.00 (exc vat). Sent using express courier, delivered within 3-5 working days from the date of your order, subject to availability. £4.50 for all all orders under £40.00 (exc vat). Sent by express courier, delivered within 1-2 working days from the date of your order, subject to availability. £4.50 select at the checkout. Sent using express courier. £8.00 select at the checkout. Sent using express courier, orders must be placed before 3pm for next day delivery, subject to availability. £15.00 select at the checkout. Sent using express courier, orders must be placed before 3pm for Saturday delivery. Orders must be placed before 3pm for next day delivery and a telephone number supplied, subject to availability. Please note that predicted delivery times are based on regular trading days Monday to Friday. Public holidays, bank holidays and weekends are outside the usual scope of our dispatch and therefore may incure additional days lead time to your order. Orders requiring calibration. Whilst we take the greatest care to get all orders dispatched and delivered to you in the stated time frame, orders received late afternoon and requiring calibration may on occasion miss dispatch that day, according to the complexity of the calibration. Be assured they will ship on the next dispatch, this in most cases should not add more than 24 hours to you delivery. Zones A & B - Mainland delivery rates apply. Zone C - Scottish Highlands. 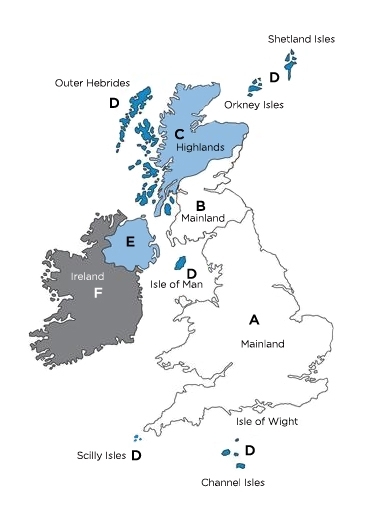 Zone D - Outer Hebrides, Orkney Isles, Shetland Isles, Isle of Man, Scilly Isles, and Channel Islands. If no shipping option is available to your selected country please call us on +44 (0) 1603 406 148 to purchase your items. Fluke Spring Promotion The New Fluke 1660 Series. The Fluke 1664 hosting exclusive features like Insulation PreTests and built in Fluke Connect Technology. FREE Gift The New Fluke 1660 Series. The Fluke 1662 is a solid, basic installation tester. FREE Gift The New Fluke 1660 Series. The Fluke 1663 is an all-round tester suitable for all electrical installers.